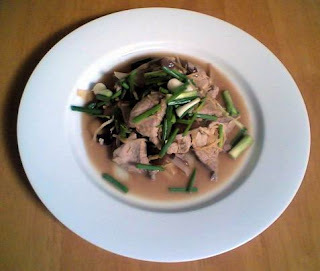 I have noticed in my food categories that there are too many of pork dishes. The reason is simply that we always eat out almost everyday (lunch and dinner : 5-6 days in a week) and when we dined out. We always ordered/order seafood, fish, beef or lamb. Chicken is not in our interest for quite a long while now as the reason of the “bird flu” and the fact that in chicken farm they feed chicken with some kind of chemical (some kind of hormones) to push them to grow faster and bigger. It’s not safe consuming lots of chicken, especially for women. That’s the reason why I cooked lots of pork dishes and very less of chicken dishes at home and I avoid to repeat eating the same thing everyday in a week. We should have more of organic food in Thailand since we are an agricultural country. Where are those organic free-range chickens?? … hardly can find them in our supermarkets. 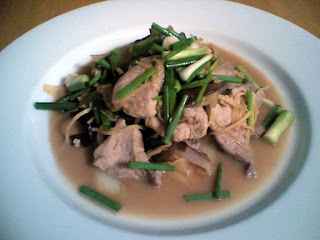 Anyway, back to my “Moo Phad Khing”. 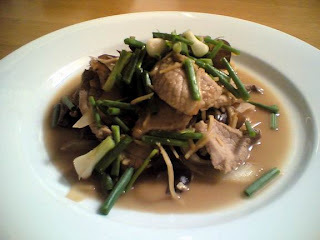 This dish is one of my all time most favourite dishes as I am personally very fond of “ginger”. I remember well that when I was young (big enough to be able to start eating “adult’s food”), Kai Phad Khing was one of the very first dishes that I learnt to appreciate. I was introduced to this dish by my Step Granny. I liked it very much as in her recipe, there was “tamarind paste” which very much helped/helps to lift up the taste of the dish.